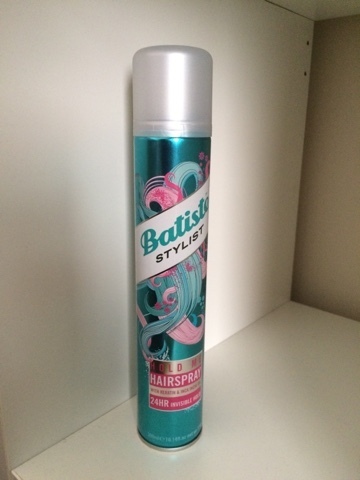 Batiste Dry Shampoo is a regular hair product of mine. We all need that extra day without washing our hair from time of time. Batiste dry shampoo gives you that extra day or just a refresh whenever needed. Recently Batiste launched a new styling range, I first saw the products advertised on TV and since I've been waiting for them to arrive in stores. On Monday; I was happy to find that Boots had the new range in and with introductory prices! I went for the hairspray to try first which was priced at £2.99 introductory price. I usually pay around £2.50-£3.00 for my regular hairspray so at £2.99 this was still within my budget. The bottle is slightly bigger than my regular hairspray too. I love the design on the bottle, its very artistic just like some other Dry Shampoo bottle designs from Batiste. This design reminds me of floating mermaid hair. The hairspray claims it holds for 24 hours, is humidity resistant, brushes out easy, is non sticky and keratin infused. After my first use of this product yesterday morning, I found that it sprayed out of the bottle well and I didn't need much to hold my hair in place. Once dried my hair didn't feel sticky or too hard like some hairsprays do. The weather was very stuffy yesterday so the humidity was quite high, my hair was still in place and didn't straying or loose shape. At the end of the day I brushed out the hairspray which was easily done just like the bottle states, I did find my hair felt slightly dry after brushing the spray out, although this happens after the use of many products on my hair. This isn't a problem for me at all. 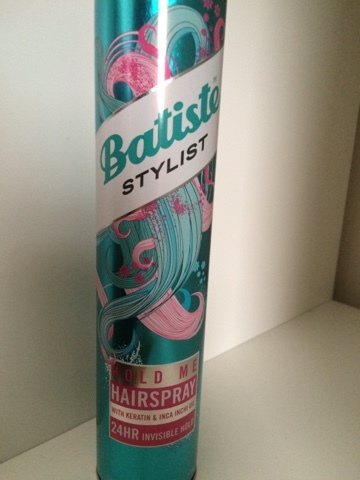 Compared to my usual hairspray, I will be using this Batiste product for everyday use because of how easily it brushes out, whereas I will use my usual hairspray for nights out only because it has a glue hold which doesn't budge at all which is great for updo's and dancing all night. 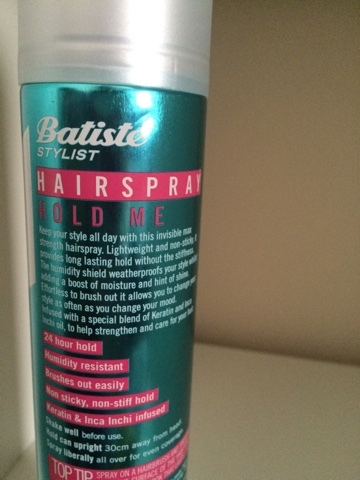 I do have to wash my hair to get rid of all the hairspray whereas I wouldn't have to do that with this Batiste one. Overall a great new product from Batiste, I can't wait to try the other products in the styling range!